So, yeah. It’s summer right now and you’re planning a couple of trips to at least escape the heat or boredom at least during the scorching hot season, and you also happen to be looking for a new router for your home or office. You’re in luck. D-Link has just partnered with Grab to offer free ride credits for every purchase of selected D-Link products! 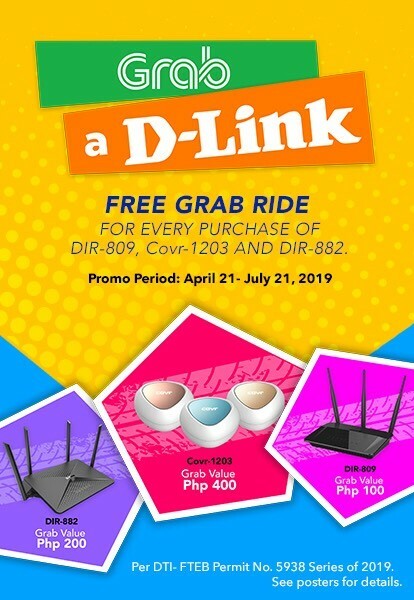 Here’s the deal – every purchase of the DIR-809 Dual-Band Fast Ethernet Router, D-Link DIR-882 Dual-Band Ultra Gigabit Router and COVR-1203 Dual-Band Whole Home Wi-Fi System, you’ll get Grab credits worth Php100, Php200, and Php400, respectively. Kind of like a cashback deal, but only in Grab credits. Those who participate in the promotion with their purchases will be given scratch cards upon validation of their receipt in the store. The Grab ride credit will correspond to the purchased D-Link item and will not be interchangeable, but each promo code can be used for multiple rides within six months until the value is maxed out. Oh, and you can have multiple transactions in participating stores to avail the promo per purchased item.